I'm really on a bright is right kick which is a constant for me as soon as it's spring and summer. I want to wear neons, glitters, eye-popping patterns, and shocking hues! With that in mind I have created a sponging nail layering that I'd like to share with you. 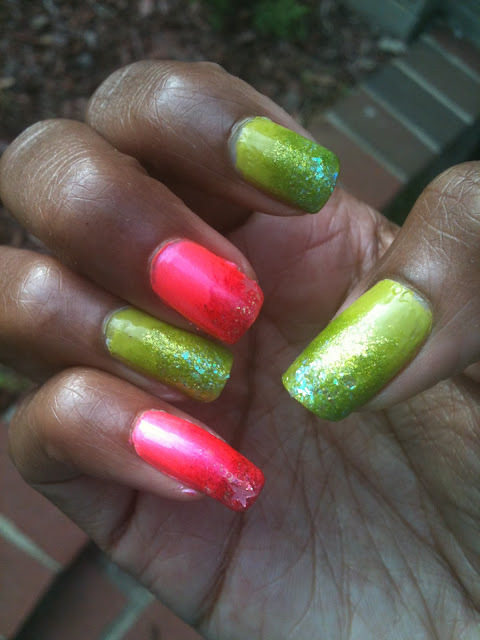 I simply took a cosmetic sponge and started layering after applying my base color - OPI Who The Shrek Are You? I overlayed it with Color Club Fly With Me and finally topped by Sinful Colors Green Ocean. Talk about a green dream come true - yum! The hints of blue fire in Green Ocean is almost edible in it's deliciousness - yes edible. For the pink I wanted to have a fun and bright contrast so I layered Claire's Paradise underneath Orly Emberstone and topped it with KleanColor Aurora at the very edge. I have to say this is my first time using a KleanColor polish and I was fairly impressed by the formulation on this one. It glided on with no fuss surprisingly for a dense flakie and only required one swipe to become apparent. I might have to pick up more of these polishes in the future. The aurora polish actually had little tiny stars in it which did not show up well and left me rather annoyed because they were difficult to place. I think this was pretty but somehow it lost it's fizzle for me though I'm not sure why though I suspect it's because I felt it was somehow incomplete without any nail art lol. In any case I just adore that flakie flash of blue in the SC Green Ocean. 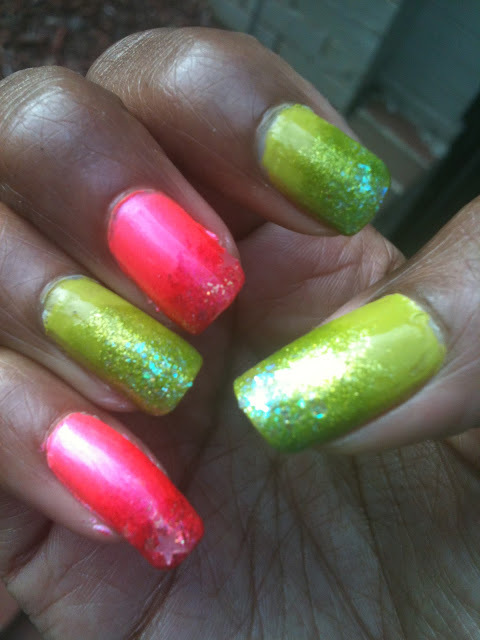 Do you ladies have any flakies or brights that you can't live without this season?